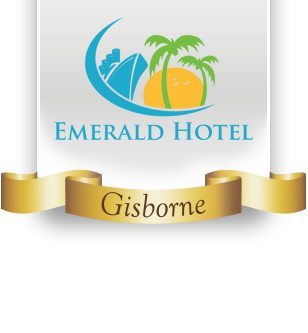 The term ‘Emerald Hotel’ or 'us' or 'we' refers to the owner of the website whose registered office is 13 Gladstone Road, Gisborne, New Zealand. The term 'you' refers to the user or viewer of our website. At the end of the booking proceedure you will be taken to a secure payment page. Your credit card will not be charged we only authorise it for $1. This allows us to then hold your credit card details on a secure server (Our payment service provider is DPS) which we will charge in the event the booking is cancelled out side of the cancellation terms. We require notification of a minimum of 48 hours in advance of the booking, that the booking is to be cancelled. Failure to do so will require full payment on the booking to be made. Emerald Hotel is committed to ensuring that your privacy is protected. Should we ask you to provide certain information by which you can be identified when using this website, then you can be assured that it will only be used in accordance with this privacy statement. Emerald Hotel may change this policy from time to time by updating this page. You should check this page from time to time to ensure that you are happy with any changes. This policy is effective from 21st January 2015.